EXPLORE CITY, WALK LESS, ENJOY MORE - Lay tire track over the tour books! Combine traditional biking with an added electric motor, making cycling and climbing hills easy. We will cover more, with less effort! E-bike ride through the spectacular Czech countryside, Cesky Kras area on your way to the 650 year old Karlstejn Castle. Enjoy the ride through the Czech countryside to Karlstej Castle on electric bikes along the Vltava and Berounka Rivers. E-bikes make covering the 35 km trip to Karlstejn village easy and enjoyable. Karlstejn Castle, with its enchanting, monumental architecture is one of the most-visited castles in the country. Our cycling time to the castle takes about 3.5 hours. During our trip we will pass through several villages, making observation, refreshments stops and lunch break. Exciting & informative bike tour takes you up to Prague Castle through the gorgeous parks with their magnificent panoramic views and continues to the greatest highlights of Prague. Our Panoramic & Prague Castle e-Bike Tour takes you along Prague's Vltava River, beautiful Letna Park, which overlooks the city and provides excellent photo opportunities. It also serves as a backdrop to a broad historical overview of this magical city. We go through Prague Castle, Petrin Park which provides more panoramic views of the city and continue to New town and Wenceslas Square. All the best places, stories, legends, curiosities of Prague and an outdoor adventure in our Big All-in-One E-Bike Tour! Big Bike Tour is the combination of our 2 tours: Panoramic & Castle Bike tour and Classic City Bike tour. We start our ride with Prague Castle, up to the most beautiful parks and panoramic vistas of Prague and finish in the city centre with Old and New Town. The tour lasts about 7 hours and is divided in two parts with a 1,5 hour break for a traditional Czech lunch and relax time. Combine traditional biking with an added electric motor, making cycling and climbing hills easy. We will cover more, with less effort! 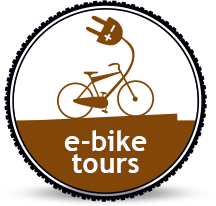 See the best of what Prague has to offer on e-bike powered tour! Take off on a spectacular bike journey down the amazing side streets of Prague, beautiful Petrin & Letna parks, stunning viewpoints, Prague Castle and enjoy all the beauty and diversity this European gem. You'll have a chance to view Prague's exceptional architecture including the famous historical and natural landmarks. This tour takes advantage of our electric bikes, combining traditional biking with an added electric motor, making cycling and climbing hills easy. We will cover more, with less effort!